UC Merced’s Athletics Department has hired women's volleyball coach and alumnus Surabordin “Ai” Prachumsri as the men's volleyball head coach. He will remain coach of the women’s team, as well. After stepping in midseason as interim head coach of the men's volleyball team, Prachumsri led the team to their best season (7-11) in program history. The team won consecutive matches for the first time in program history and earned a spot in the conference tournament. “It has been a privilege to watch the men's team grow over the years and it is a blessing to get the chance to lead this group of young men,” Prachumsri said. Prachumsri led the women's team to a 12-13 record last season. After a slow start, Prachumsri rallied the team and they finished strong, winning 10 of their final 12 matches and securing a place in the California Pacific Conference semifinals. 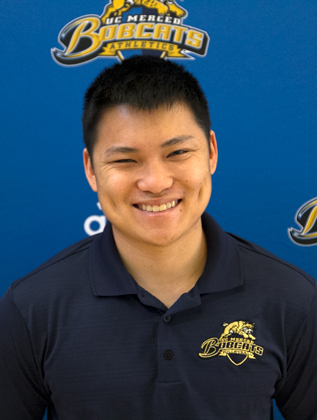 Prior to the 2016-17 year, Prachumsri was a member of the UC Merced men's volleyball coaching staff for the past two seasons where he assisted in all aspects of the program from administrative responsibilities and recruiting to practice planning. He joined the women's volleyball program as the lead assistant for the 2015 season. That season was the team’s most successful to date, with a 14-10 overall record and a 6-4 mark in conference play. As a student-athlete at UC Merced, Prachumsri competed on the men's volleyball club team for three years and in 2013, as the program was elevated to the intercollegiate level, he competed as the starting libero for the inaugural squad. He graduated in 2014 with a bachelor’s degree in bioengineering.